I have this magnet on my desk at work that I look at from time to time. It has Isaiah 40:31 on it. ...those who hope in the Lord will renew their strength. They will soar on wings like eagles; they will run and not grow weary; they will walk and not be faint. I was reading it this morning and found myself really trying to understand what it really meant. I've always loved this verse. It seems poetic and it just sounds appealing. I don't know about you, but I'd love to go through life not feeling weary. I'd love to walk this road without feeling the spiritual and physical exhaustion that often accompanies the burdens we tend to carry. I believe that it is possible to live in such a way, where your heart is fully surrendered to God, so that in the toughest times, you can endure without feeling as if the world will come crashing down on you. What I love about this verse though is what is says you actually need in order to live this way. Those who HOPE in the Lord. When I feel down and discouraged, when things aren't going my way and I want to just give up, I have to ask myself if I've lost focus. If I've lost sight of what really matters. Where is my HOPE, in my moments of despair. Am I looking around at all my troubles and feeling overwhelmed by them? Or am I trusting in the one who has never let me down? 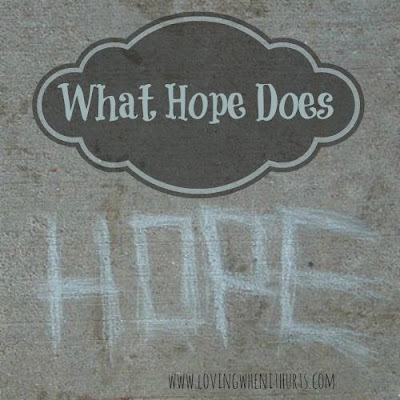 Is my HOPE securely rooted in God and in His promises? Oftentimes, I lose sight of this. I begin to feel burdened, and my cares drag me down. I'm learning that in these moments, if I feel like I just can't take much more, that I have misplaced my HOPE. I have assumed control and am trying to make it all fit together and work out the way I want. My HOPE is NOT in the Lord. It's no wonder I so often feel overwhelmed with the weight of my own problems. I become so consumed by them, and am prone to despair. But this verse tells me that if my HOPE is in the Lord, my strength will be renewed. I will be able to journey on this road without feeling the weariness that often threatens to consume me. I will be able to walk on this narrow path and never tire. This should be an encouraging word to all of us! We have a God who loves us and who promises that if we only put our HOPE in Him, He will come through for us. He will give us the strength we need to make it through another moment, another day, another year. So the next time we feel like our world is crashing down around us, my prayer is that we will stop and evaluate where our HOPE is, in that very moment of despair. If it is not in the Lord, we cannot expect to feel better or change our perspective about life's troubles. It is only in HOPING in Him that we will feel His peace that surpasses our human understanding.